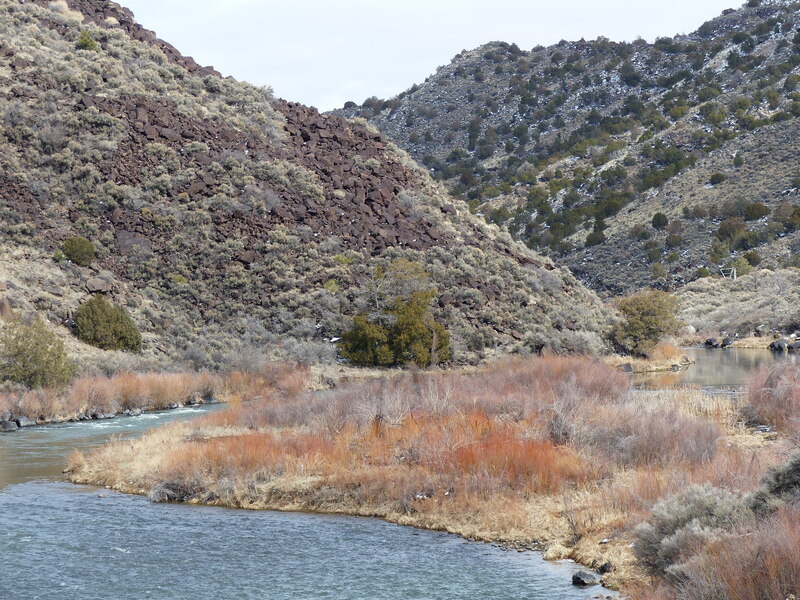 Rio Grande del Norte National Monument, location of today’s eagle drama. 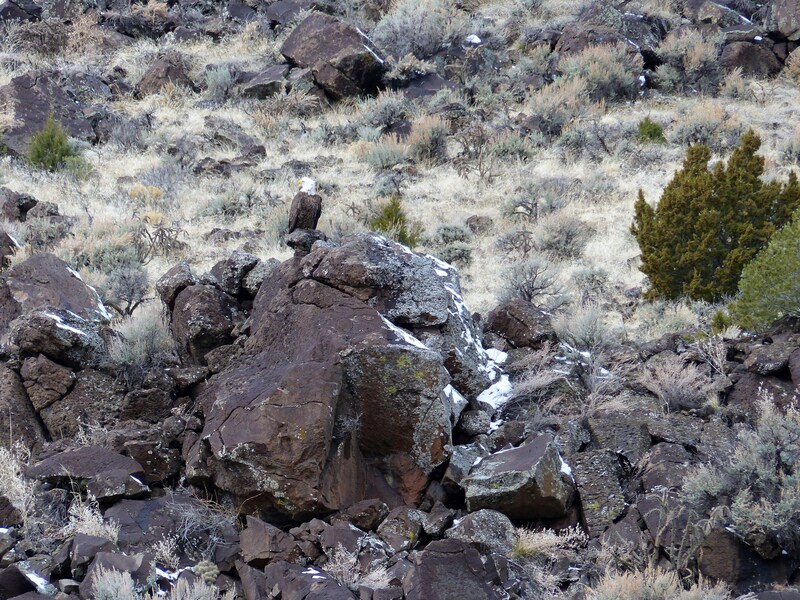 The Bald Eagle’s plumage allows it to blend in with the brown desert varnish of basalt boulders and dabs of snow. Today’s sunny interim (between yesterday’s storm and tonight’s) beckoned, and so my neighbor and I decided to drive through Orilla Verde and along the Rio Grande to see what was up. In a word, plenty. Past Petaca Canyon, a commotion barely 100 feet up the canyon wall caught our attention, so I pulled the car to an abrupt stop in the middle of the road. Is that a…..yes, it is! A Golden Eagle was giving chase to a madly flapping raven. What’s he doing down here along the Rio? We watched for nearly five seconds before the tides turned, and the raven, joined by another raven began chasing the eagle. They had just flown across one of those avalanche trails from last summer’s rains when, seeming out of nowhere, a Bald Eagle swept into the midst of the fray and the three-some split off, only to resume their back-and-forth chase. Finally, the GOEA landed atop a basalt boulder, giving my friend and me, both of us in a state of shock, a chance to back the car up, turn around, and pull off the road. We located the GOEA on a boulder across the river, who soon was in flight again, gaining altitude in the canyon, pursued now and again by the ravens. The GOEA flew nearly overhead, swooping across the entrance to Petaca Canyon, then back, then up to rim opposite us. Five crows continued the harassment along the rim. Whew! In our drive down to the Junction Bridge and back, we were able to confirm five Bald Eagles along that 5-mile stretch of river. Perhaps the best Bald Eagle display came on our way back, along the fisher path that leads northward from Rio Bravo campground. We’d noticed the pair of BAEA on our earlier drive through. They were still apparently motionless, still atop their hang-out boulders across from Rio Bravo campground. We were walking along the path when they both suddenly took off (we thought we’d disturbed them), but they both began circling over a flock of Goldeneyes, a couple dozen in all. They circled again, swooping closer to the ducks and the river. We dared not move any closer, though we tried for the best view we could from among the willows. I thought, they’ll never circle over the Goldeneyes again because we are right here! But they did, at least twice more, both of the eagles, getting very low. The ducks, meanwhile, did not take flight. This was amazing to us, as we all know how skittish Goldeneyes are. They began to move in unison, first to the left about ten feet, then to the right, then left again, sometimes bunching up close together. I thought, will an eagle actually pluck a duck out of the water? Right then one of the eagles descended into the middle of the flock and plucked from the water a…….fish! I’m watching the eagle carry the fish in its talons overhead, thinking, that’s not a duck! The moral of the story….get out and bird! This entry was posted in National Monuments and tagged #birding, #nature, #wildlife on February 25, 2015 by Meg.